9233 Hwy. T-33 S. (six houses east of Sully Christian School), Staci Jansen, Friday 4-6:30 p.m. Wedding stuff (tulle, lights, glassware, candles, gemstones, ribbon, bubbles, silk flowers, and much more), boys' clothing, girls' junior clothing, shoes, twin bedspreads, digital photo frame, books, puzzles, videos, CDs, CD player, photo books, seashells, wooden doll house, chest of drawers, desk, music stands, home decor, luggage, sawhorse, Christmas, MUCH misc. 804 7th St., Dawn Allbee. Girls' clothes 2T-4T, girls small bike with training wheels, road area rug, two end tables, dresser drawers, much misc., baby bed. 802 7th St., Shelly Vos. Baby-toddler clothing - boys' NB-4T and girls' NB-3T, some men's L and XL, lots of women's S-XL, kids' toys, some household items, misc. items, women's sandals and shoes, kids' shoes, some men's shoes, outdoor coats, Thirty-One items, purses, books, DVDs. Don't want to miss! 901 7th St., Diane Vos, Friday 3-7 p.m. Fall closet clean out! Girls' clothing 10/12 to juniors' and women’s plus size, men’s clothing, Under Armour, pogo stick, Longaberger, American Girl clothes, Coach, Fitbit One, jewelry, fall decor, Christmas, throw rugs, Dutch lace, computer monitor, home decor, camping chairs, lots of excellent finds! 504 12th Ave., Stefanie Van Wyk and Sharon Renaud, Friday 4-7 p.m. Name-brand women’s, men’s, and children’s clothing starting with girls’ 4/6 and boys’ 10/12. Pack ’n Play, triplet baby doll stroller, home decor including fall/Halloween, salon hair products, kitchen misc., shoes, jewelry, home decor, books, video games, toys, and misc. Priced to sell! 204 5th St., Kristin Lewis, Friday 4-6:30 p.m. Lots of boys' clothes NB-2T, toys, baby supplies, women's and men's clothes, maternity clothes, household items, curio cabinet, lawn sweeper, bathroom cupboard, Ford bed extender, blinds for sliding glass door, medicine cabinet, end table, shelving. 101 5th St., Dan Stouthammer. Kids' and adult clothing, misc. 810 4th St., Donna Zylstra. Women's clothes M-XL, boys' clothes 10-12 and up, seasonal items, oak frames (8x10, 11x14, 16x20), lots of misc. 805 4th St., Brummel, Nikkel, Rozendaal, and Winegar, Friday 3-7 p.m. LOTS of kids' clothing! Girls’ 2T-7 and boys’ 3m-4T, women’s clothing S-XL, shoes, misc. household items, toys, baby items, girls’ 18” bike, couch, double stroller. 305 8th Ave., Schnell, Scholten, Irlmeier, Friday 1-3 and 5-7 p.m. Name-brand clothing including great quality coats and snow pants - girls' 7/8-14/16, boys' 4T-7, women's; kids' and women's shoes including girls Bogs boots; kids books and toys - lots of horses, car seats, 12" boys' bike, 18" girls' bike; home decor. 1002 3rd St., Sandi De Vries, Friday 4-8 p.m. First-time garage sale. Tons of kids' clothes, shoes, coats, and boots, boy NB-4T, girl NB-6/6X, also baby equipment (ExerSaucer, swing, high chair, etc.) and toys (inside and outside). See living estate/moving tag sale ad at right. 801 3rd St., Janel Hay, Saturday 7-?. Girls' clothes NB-12 teen, boys' clothes NB-16 teen, toys, shoes, womens' S-XL, men’s M-XXL, adult bikes, table saw, Pinterest items, children's desks, headboards, chairs, tables (kitchen, coffee, and end), chest of drawers, doll house, Christmas deer, men's coveralls 44R, men's leather jacket 3X, priced to sell! 707 3rd St., Janae Vander Wilt multi-family sale, Thursday 3-6 p.m., Friday 2-5:30 p.m., Saturday 7 a.m.-1 p.m. Boys up to 12, girls up to 7 (tons! ), bikes, shoes, toys, books, women's household, sit 'n stand stroller, fall/winter items. 605 2nd St., Judy Van Kooten and girls, Friday 4-7 p.m. Boys' and girls' clothes NB-youth, adult clothes and shoes, end tables, coffee table, ExerSaucer, stroller, Chicco KeyFit car seat base, Xrocker video game chair, toys, books, games, baby items, Tupperware, household items, holiday decor, kids' hall tree, FREE Christmas tree, winter coats, something for everyone, FREE items, early sales permitted. 201 5th Ave., Rozendaal, Scholten, Maasdam, Friday 4-6 p.m. Boys' 0-12m, teen boys' clothes, girls 3T-5, teen girls' 0-5, bargain American Girl Doll outfits, booster seat, who knows what else! 300 4th St., Kelsie Van Haaften, Friday 3-6:30 p.m., Saturday 8 a.m.-noon. Name-brand juniors' and womens' S-XL, pants size 12, shoes size 7-10, name-brand men’s M-XL and pants size 36, boys'/girls' NB-18m, fall queen comforter set, purses, jewelry, nursing books, kitchen utensils, lots misc. 207 4th St., Shelley Vander Molen, Friday 3-7 p.m. and Saturday 8-noon. Lots of misc. items, clothing, books, toys, kitchen items, something for everyone. 204 4th St., Jen Torres. Moving sale, end tables, tons of kitchen appliances, toddler girl clothes, men's and women's clothes and shoes, misc items. 402 1st St., Pam Van Der Zyl, Friday 3-6 p.m., Saturday 8-noon. Huge moving sale! Oak table with leaves and five chairs, oak curio, twin bookcase headboard, computer desk, Gazelle exercise machine, elliptical, craft items, new Cricut Explorer, floral shop quality silks and supplies, much home decor. 705 N. 2nd St. (new development across from elementary school) Dana McFarland, Friday 4-6 p.m. Men's and women's clothing, girls’ and boys’ up to 12/14, toys, VHS and DVDs, home decor, and more! 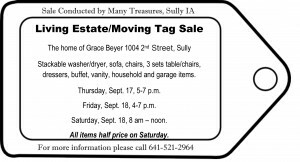 11969 S. 80th Ave. E., large barn sale at Many Treasures near Sully, Friday 3-7 p.m., Saturday 8-noon. Furniture, antiques, collectibles, and lots of misc. 7957 Hwy. T22 S. (one mile south of Killduff in shop), Jenn Van Gorp, Friday 4-7 p.m., Saturday 7 a.m.-1 p.m. Little Tikes Cozy Coupe, riding toys, Avent pump, stroller, boys' and girls' winter coats, girls' clothes 0/3-18/20, ladies 0-6, 12-14, and S-XL, boys' clothes 0/3-8/10, maternity L/XL, boys', girls', and women's shoes, UA headbands, Maurices, GAP, Justice, John Deere, Carhart, girls' twin ladybug comforter set, John Deere twin bed sheets - two sets, crib sheets, purses, books, toys, home and holiday decor, items with tags, new toys, new women's size 10 ASICS, homemade jams, canned, and baked goods, and much more, do not want to miss! 9437 Diamond Trail Lane (right across from the golf course), Melissa Rozendaal, Friday 4-7 p.m., Saturday 7 a.m.-1 p.m. Infant/toddler boys' and girls' clothes, junior and women's clothes, bottles, sippies, Diaper Genie, infant/toddler shoes, some home decor. Must come see this sale! 504 Center St. (old Lynnville Seed building), seven-family sale (Ver Ploeg/Warrick), Friday 3-7 p.m. Boys' and girls' clothing infant through junior, adults including tall men's and plus sizes, baby items (large and small), play mat, toys, bikes, Halloween costumes - children and adult, leotards, dance shoes, misc. items including holiday, Cricut, Longaberger. Cash only. 201 Maple St., Hardeman, Friday 4-6 p.m., Saturday 7-11?. Boys' clothes 4T-Youth M, girls' clothes 3T-4T, women's and men's clothes, men's winter coats, kids' boots, lots of kids' shoes, Graco double stroller, king-size down comforter, boy's full-size comforter with sheets, bed rail, printer, household misc. 404 East St. (Lynnville Public Library). Stop by the Lynnville Library and browse our activity room full of books for sale. Interested in westerns? We have tons of L'Amour and Zane Gray! We also have a large assortment of Christian fiction, nonfiction, and popular fiction writers. All books available for a donation for the purchase of new library materials! See you at the library. 9371 E. 142nd St. S. (house is just past Old Setts), Tim Sparks, Friday 4-7 p.m. Lots of toys, NASCAR items, Barbies, games, clothes (boys, girls, and adult), many misc. 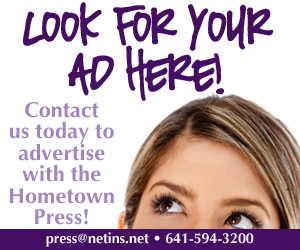 items, sports equipment, furniture, household items, Pinterest projects, and more! 301 Hill St., Searsboro Community Church, Saturday 8 a.m. Basement sale and bake sale, kid-adult clothes, household, and collectibles. Lunch served from 10:30 a.m.-1 p.m. including sloppy joes, hot dogs, chips, and drink by freewill donation. 208 1st St., Jerry and Shirley Tremmel, Friday 8 a.m.-5 p.m., Saturday 8 a.m.-?. Tools, household, three-wheel electric scooter, two-WD ATV, misc. 527 Main. St., Steve and Diane Angove, Friday 8 a.m.-5 p.m., Saturday 8 a.m.-?. Whirlpool portable washing machine, household, lots of misc. 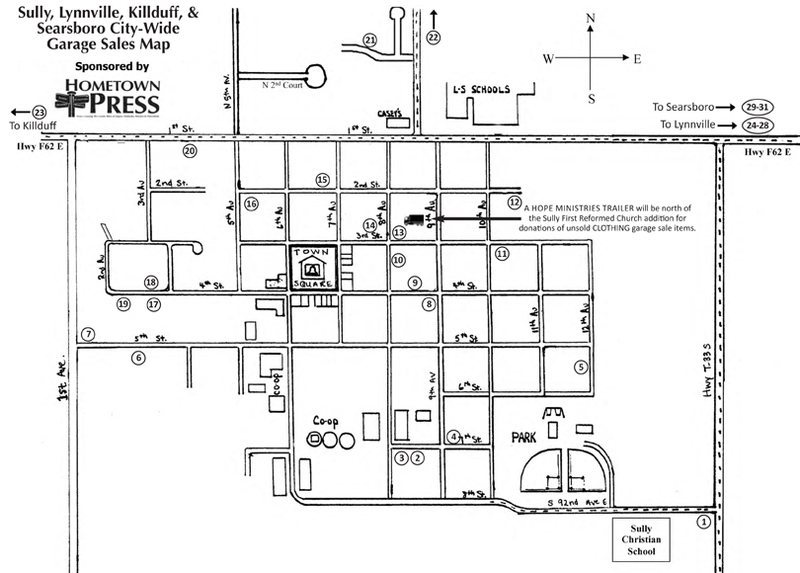 Printed maps available after 5 p.m., Friday, Sept. 18, at Casey’s and Coffee Cup Cafe in Sully and ZIP IN in Lynnville. PAY IT FORWARD is accepting donations for leftover clothes, backpacks, coats, and shoes. No toys or household items. Call Kelli Johnson at 641-780-8376 to arrange pick up, or drop items off at 402 5th St. or 407 5th St., both in Sully.